Bill Goldberg followed in the paths of many wrestlers who have made the transition from the gridiron to the squared circle to become wrestling stars – he just did so faster and to a greater magnitude than anyone else in history. In only his second year in the business, Goldberg became one of the biggest names the wrestling business has ever seen. And now, Goldberg has transitioned from being a star in the ring to a television and feature film star. Bill Goldberg was not a typical wrestling fan growing up, but instead focused most of his attention on football. An excellent player in high school, Goldberg starred as an All-SEC and All-American Nose Guard at the University of Georgia. When his career as a Bulldog was over, he eyed stardom in the National Football League. After spending time with the Los Angeles Rams and then winning the World Bowl with the Sacramento Surge of the World League of American Football, Goldberg signed on with the Atlanta Falcons in 1991. After three years with the team he suffered a torn abdominal muscle which put him out for the 1994 season. Goldberg was signed by the Carolina Panthers in 1995, but could not rebound from the injury sufficiently enough to play. He was thus forced to retire from football. Goldberg began quickly mowing down his opponents with his patented Spear and Jackhammer combination. Eventually he got his chance at the gold when he wrestled Raven for the WCW United States title. Showing little nervousness in his first title match, he quickly overpowered Raven and pinned him for the title belt. With his reputation and winning streak growing, everyone looked forward to a showdown between Goldberg and Hollywood Hulk Hogan for the WCW World Heavyweight championship. In front of a red-hot crowd in Atlanta, Georgia on July 6, 1998, Goldberg speared Hogan and then hit the Jackhammer to obtain the pinfall. With the championship belt around his waist, he was now the biggest name in the sport and finished the year as the PWI Rookie of the Year. Over the next year, Goldberg found himself battling members of the New World Order and other wrestlers striving for his title. Finally, Kevin Nash, after interference from Scott Hall (who used a tazer on Goldberg), was able to pin the champion. Goldberg subsequently placed himself in a hunt to reclaim his gold, often taking on various factions of the NWO. During one of these confrontations, Goldberg ran out into the parking lot of an arena and punched his fist through the windshield of a car. In doing so, he suffered a cut to his arm that took almost 190 stitches to close and which almost hit a nerve, seriously placing his career in jeopardy. For almost six months he was forced to the sidelines and relegated to making publicity appearances and participating in the many charities he supports. Finally, after a great deal of speculation that he might not be able to make it back to the ring, he did so in June 2000 to a great ovation from his fans. Goldberg’s success continued, and fans were thrilled as Goldberg mowed down his opponents. 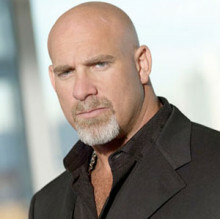 Bill Goldberg has been able to utilize his notoriety to obtain roles in Hollywood films and appearances in major publications and on various television shows. Goldberg, who was named one of the 100 most powerful people in the sports industry by The Sporting News and has graced magazine covers from Entertainment Weekly to TV Guide, has also been featured in articles in People, Spin, Rolling Stone, Gear, and USA Today. His many talk show appearances include The Tonight Show with Jay Leno, Live with Regis and Kelly, Larry King Live, The Dennis Miller Show, Turn Ben Stein On, and The Man Show. Goldberg’s starring roles in feature films range from The Longest Yard and Santa’s Slay to his roles in Warner Brothers Pictures’ Looney Tunes: Back In Action, Ready to Rumble and Universal Soldier II. Do you want to hire Bill Goldberg? Directly request a quote. In 48 hours we can send you the availability of Bill Goldberg If you would like to book Bill Goldberg, Entertainment Booking Agency is the right place. We will offer you the best price and contact the management or we directly contact Bill Goldberg. For corporate appearances or speaking engagements you can contact our agents and the will help you true the process. Tags: hire Bill Goldberg, Bill Goldberg booking, book Bill Goldberg, Bill Goldberg appearances, find more information on booking Bill Goldberg for appearances, Bill Goldberg speaking engagements, Bill Goldberg endorsements/spokesperson, Bill Goldberg appearance fees, Bill Goldberg booking agency contact info, biography of Bill Goldberg, Contact an artist booking talent agent find a speakers bureau that can book Bill Goldberg, speaker booking agency for Bill Goldberg, Bill Goldberg booking agency, Bill Goldberg booking for corporate event. EBA is one of the biggest entertainment booking agencies in the World. We book hundreds of celebrities, artist, athletes and speakers in a year. Important to know is that we are not claiming to be the management of Bill Goldberg. We are not the official agent for Bill Goldberg. Companies from around the globe book these artists and speakers true our company be course we have one of the biggest networks and we always have direct contact with the artist or the management. We help you to find the right celebrities for your corporate of private events. Please contact one of our agents to get free advice and we will help to get the world-famous artist on your party.